Cartilage and bone health are important for long term wellbeing. 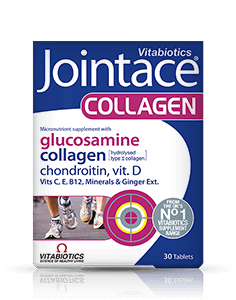 Jointace Collagen has been developed by Vitabiotics nutritional experts and provides unique combinations of trace minerals, vitamins and nutrients, ideal for those with an active life, in sport or in later life. Jointace Collagen provides a high-grade collagen which is hydrolysed to improve absorption and unlike some sources of collagen it contains high levels of the key amino acid hydroxylysine. Collagen is a structural protein found in several connective tissues in the body including bones, cartilage, gums, skin, tendons and blood vessels. 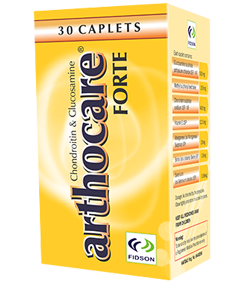 Vitamin C contributes to normal collagen formation for the normal function of bones and cartilage. Copper contributes to the maintenance of normal connective tissues and therefore can be beneficial to cartilage (as cartilage is made up of connective tissues). Vitamin D, zinc and manganese all help to maintain normal bone. 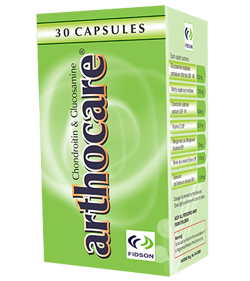 Vitamin D3 is provided in its Cholecalciferol form as naturally produced by the body on exposure to sunlight. 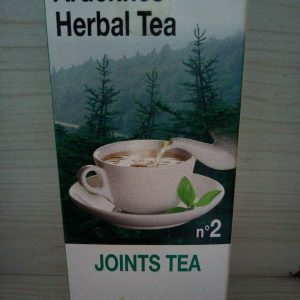 Along with trace minerals, Jointace Collagen provides Glucosamine present in the preferred potassium form, and a high quality LMW (low molecular weight) form of Chondroitin.